Returning to headline The High Watt tonight, June 26, after passing through last fall to co-headline a show with !! !, Atlanta’s Algiers are a profoundly artistic, socially urgent, refreshing and genre-bending project that should be on everyone’s radar. This time around, the group perform with Knoxville experimental artist Lower Interiors, as well as likeminded local experimental/dark pop project Lambda Celsius, a stacked and well-matched trio of performers that offer up one of the most unique and boundary-pushing bills of the season. Tickets are still available here, so grab yours now and read on for more about the show! 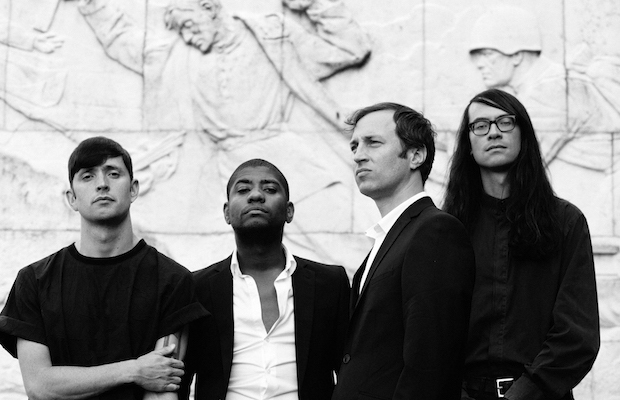 Atlanta’s Algiers have formally been a band for a decade, and have been making music together even longer, yet they feel more suited to right now than just about any other act. Southern, multiracial, genre-bending, politically and socially motivated, intelligent, and philosophical, the group combine post-punk, experimental rock, gospel, and art rock, informed by sweeping, atonal, layered textures to craft an urgent and impassioned style with more nuance and originality than most bands could ever hope to achieve. Their eponymous debut full-length arrived in 2015 on Matador, and their followup, The Underside of Power, just last summer, but already the band have been amassing major and well-deserved buzz, touring the world, and honing their intense and immersive live show. Musically, they gel with a variety of punk, indie, and experimental acts, but seem more focused on tackling social unrest than just making music for sake of artistic praise, resonating with an incredibly smart and substantive style, and one unique, essential, and awesome performance style. Hailing from nearby Knoxville, Lower Interiors is a project that is fairly mysterious to us. Apparently formed last year, and, from the look of their photos, potentially a one-woman endeavor, only one track, a 20-minute live recording from Knoxville’s The Pilot Light, is available, and showcases an experimental, spaced out sound that fits well with some of Algiers’ weird and more subdued tendencies. Currently on the road with Algiers, we have a feeling Lower Interior will resonate perfectly with fans of the headliners. Opening things up, local(ish) outfit Lambda Celsius (or Λ°C, as they prefer to spell it), play a fusion of dark, experimental, electro-laced pop, post-punk, post-industrial art rock, which feels uniquely well-suited to kick off this show. Primarily the live alias of musician, artist, producer, and designer AC Carter, Λ°C has been a staple of the local underground scene for several years now, frequenting DIY bills while honing her smart, substantive, socially charged and profoundly creative and artistic style. Needless to say, you don’t want to show up late for this one. Algiers, Lower Interiors, and Lambda Celsius will perform tonight, June 26 at The High Watt. The show is 18+, begins at 8 p.m. (doors at 7 p.m.), and tickets are available to purchase for $15. Catch Basecamp, Daniella Mason, & Villz TONIGHT at Exit/In!